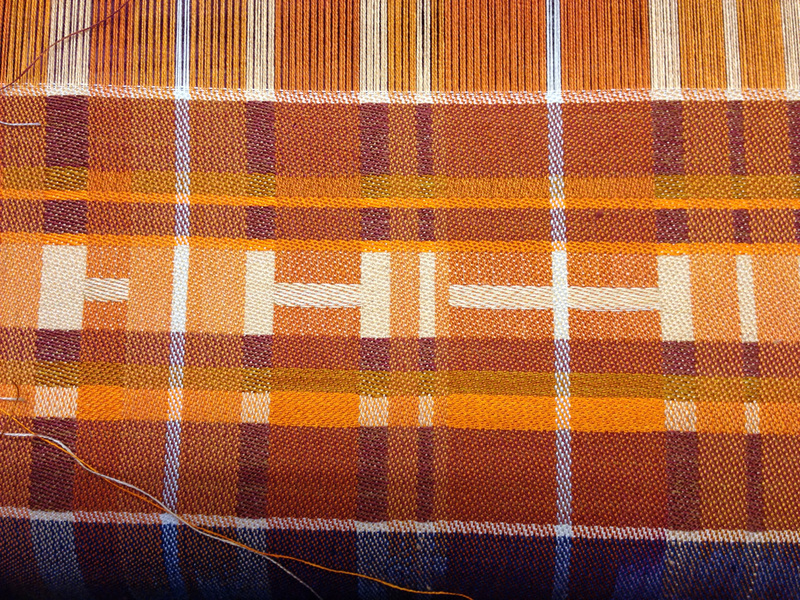 Sorry for the radio silence – I’ve been busy weaving! I have now completed five of the 16 sections – black and white, purple monochrome, orange monochrome, red/orange yellow at low saturation, red/orange/yellow at high saturation. 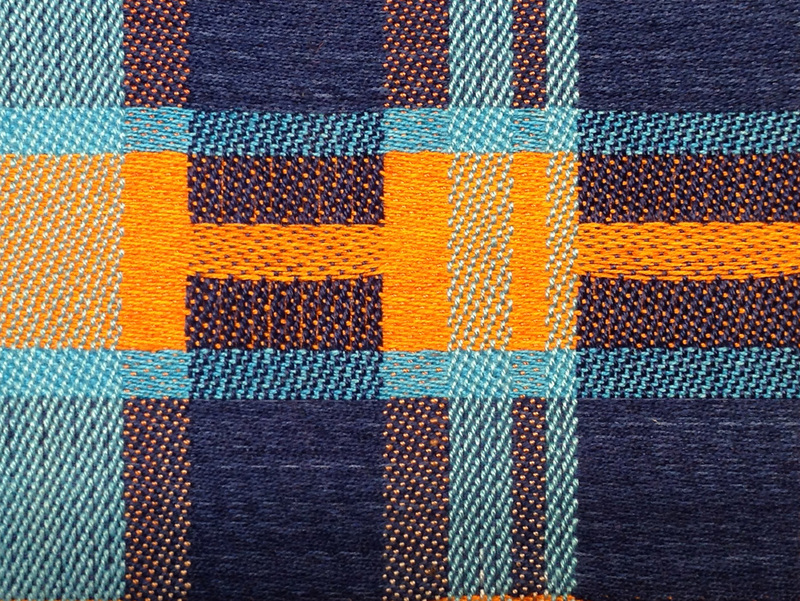 Sample #1 has all stripes equal width, with a regularly repeating color pattern, in both warp and weft. The result is a very rhythmic, even pattern – one that would go well where you don’t want any particular part to catch the eye. Napkins, for example. 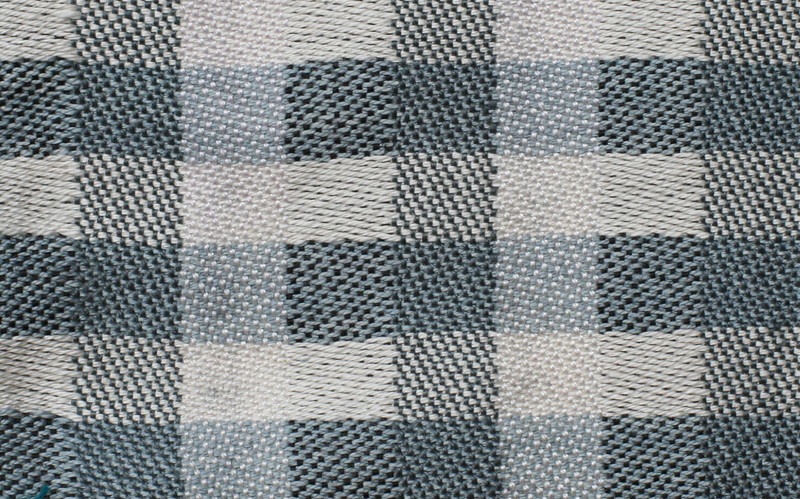 Sample #2 has rhythmic stripes in both warp and weft – the color patterns and stripe widths are arranged symmetrically, resulting in a regular plaid. This has more irregularity than the equal-width pattern, adding more visual interest and energy. (Which could also be interpreted as “more busy”, depending on whether you liked the change or not.) This might make an interesting pattern for a jacket, as it adds visual interest without demanding 100% of the eye’s attention. 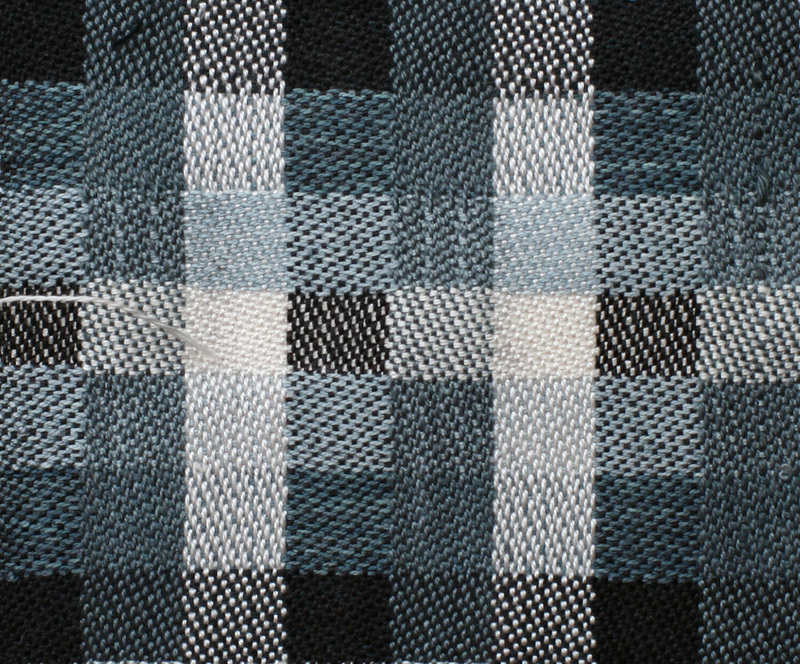 Sample #3 has stripes in a Fibonacci ratio – each stripe is a Fibonacci ratio to its neighbor – and woven “as drawn in”, i.e. 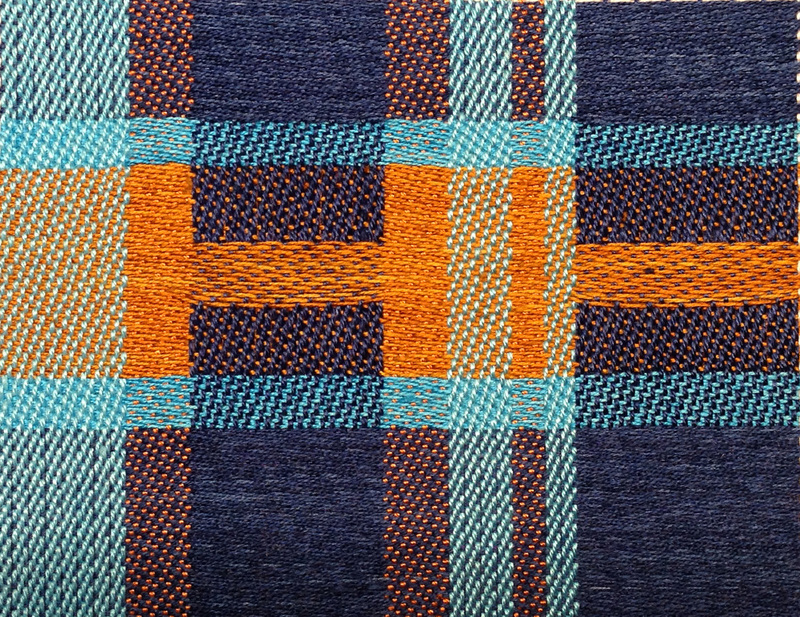 with the same color and stripe-width sequence in warp and weft. Because there’s no symmetry and no repetition, it feels more chaotic to the eye, and because the lighter colors are in the top left, the eye is drawn to the top left, leaving the composition somewhat unbalanced. This might be useful as part of an art piece – or as more visually interesting napkins, depending on how you feel about napkins! 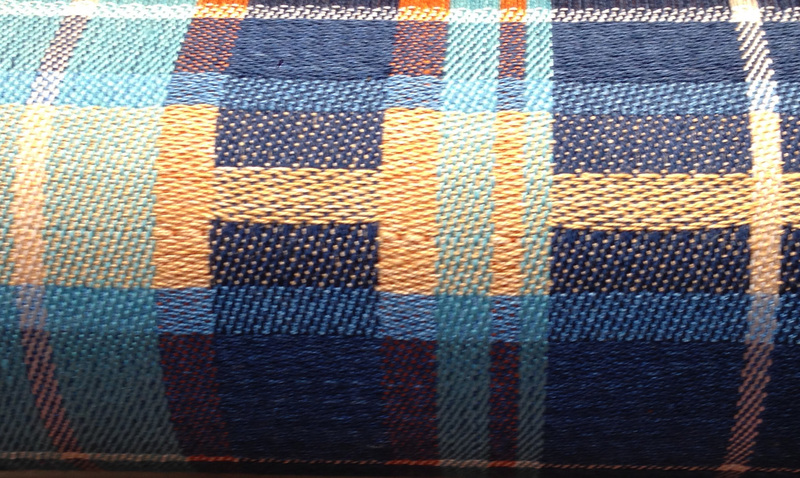 Sample #4 is irregular both in warp and weft, pattern and color. It has no rhythm at all, so it feels the most chaotic of the four samples, and I’d be least inclined to use it. It feels more like a jumble of color than something intentional. Remarkable how rhythm and repetition affect the feel of a piece, no? 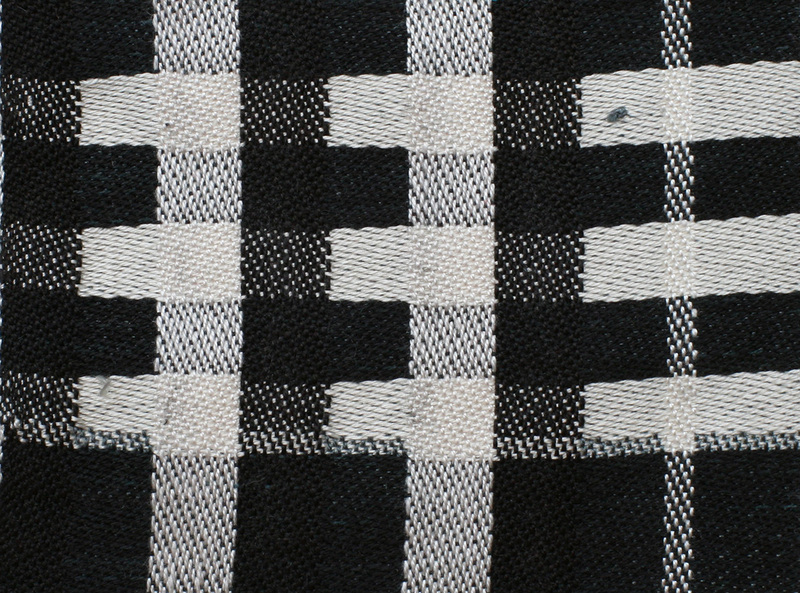 I’ve now woven two and a half sections of the color study – all monochrome. 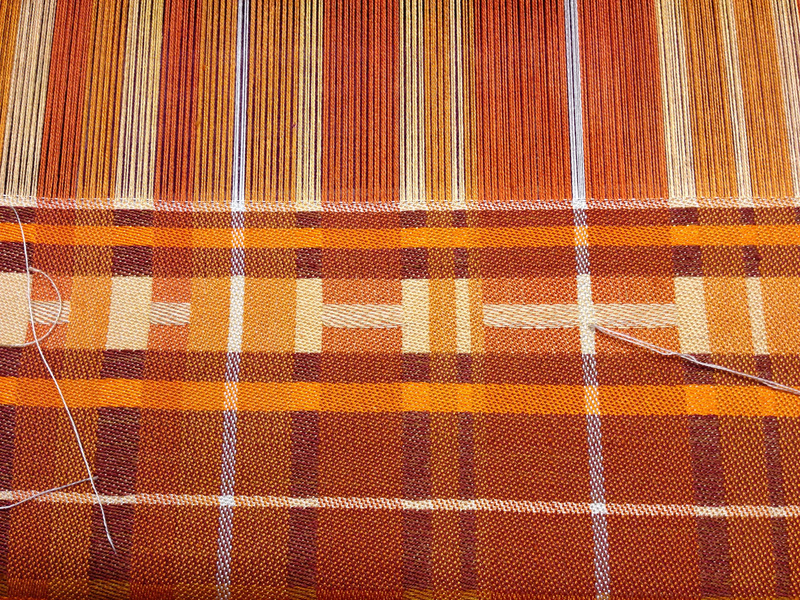 The first featured black, white, and gray in the warp; the second was shades of purple; the third (still in progress) is shades of rusty orange. 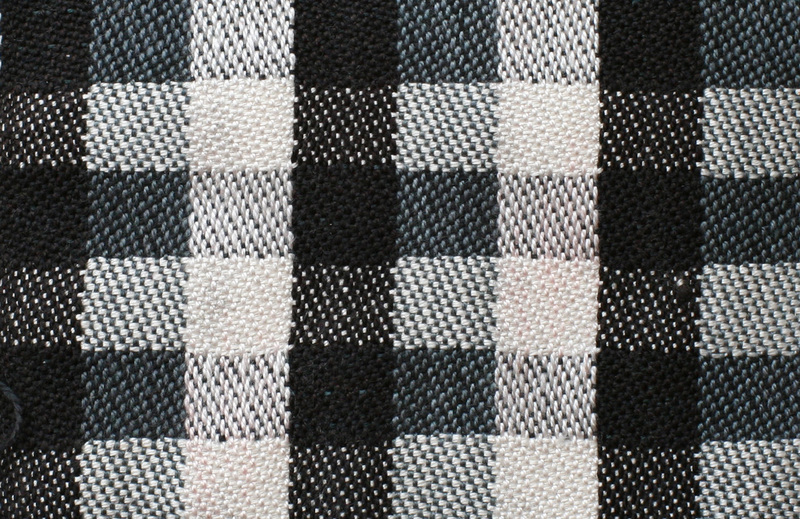 The black/white/gray section of warp was all about playing with value (lightness/darkness). I did one section in (nearly) pure black and white, one section with a wide range of values (white/black/several shades in between), one in whites and pale grays, and one in black and dark grays. 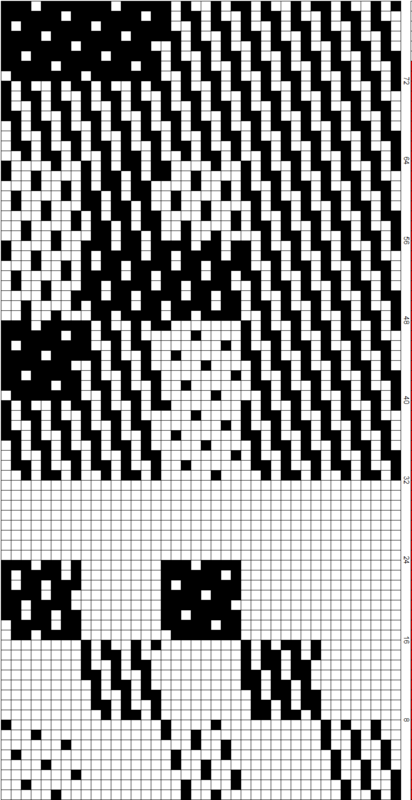 By mixing the white, medium gray, and black in the warp with white, pale gray, medium gray, and black in the weft, I managed to cover most of the value spectrum. Alas, no photos – I forgot! 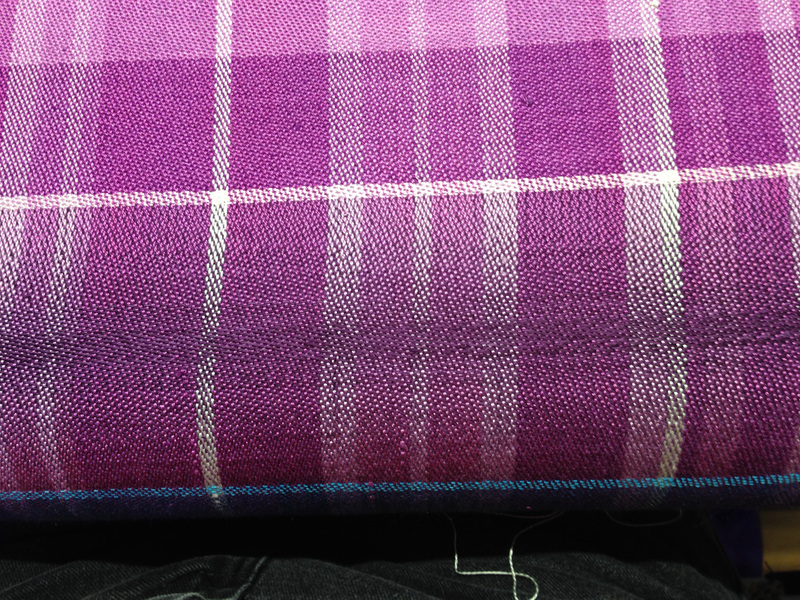 As soon as I take that section off the loom, I promise photos and commentary galore. Here I was playing with shaded satins and a dark purple weft. I wanted to see if I could blend from 1-7 to 7-1 satin without a telltale line at the transitions. I spent some time messing with Photoshop to see if I could get it to do a semi-random gradation between, say, a 1-7 and 2-6 satin. Finally I just gave up and “feathered” the edges of the transitions by hand. The result? I think it shaded very nicely and gradually, without obvious transitions – right up until it hit the 1/7 satin section (the dark purple line in the center). For some reason, this came out much darker than I expected. If I use this trick again, I’ll omit 1-7 satin. But shading by hand is quite laborious, so I may ask my Photoshop-savvy friends if they know a better way. Photoshop is so powerful that I’m sure there must be a way. 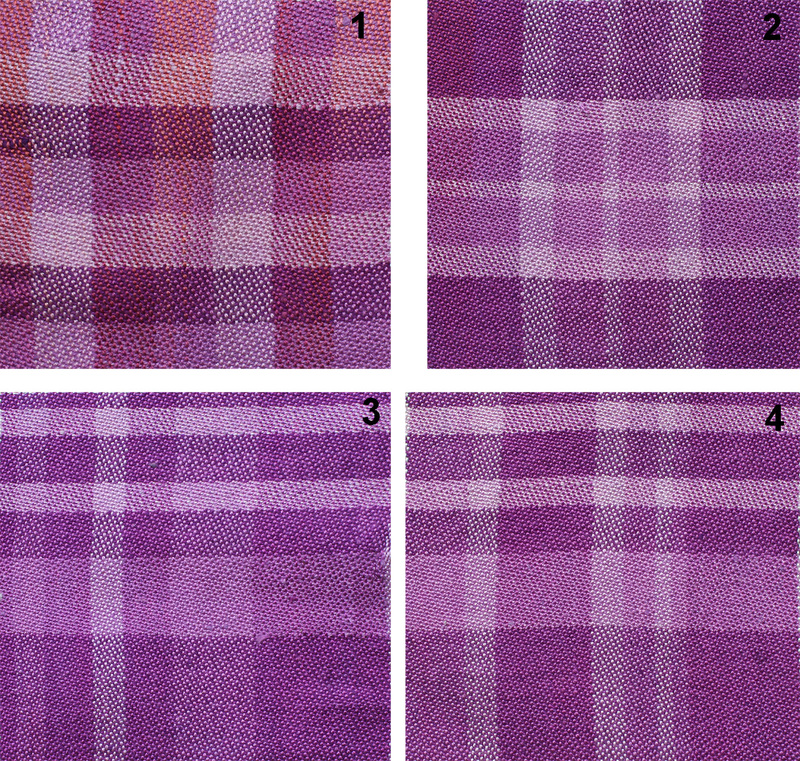 The leftmost color is actually white, so technically it was only four shades of purple, but they made a very nice value spectrum from light to dark. 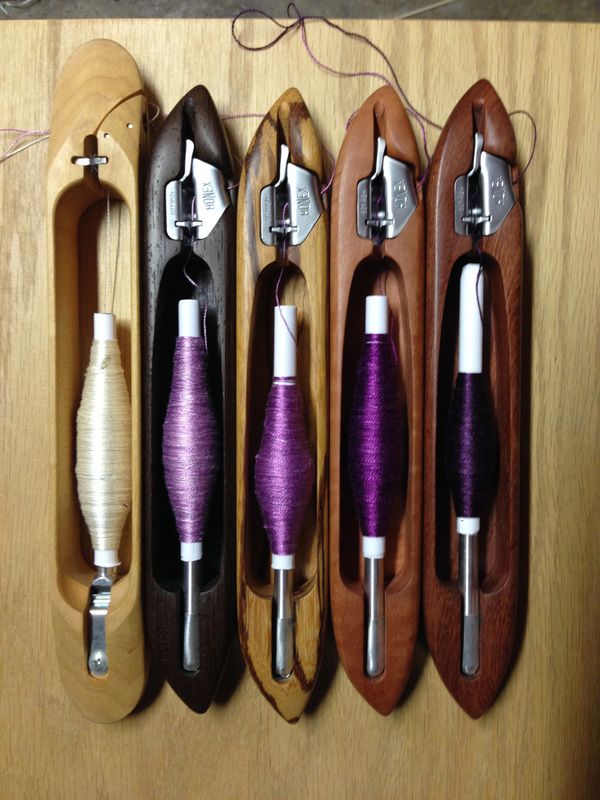 And apparently four Bluster Bay shuttles isn’t enough; I had to use one of my remaining Schacht end-feed shuttles to hold the fifth color. Fortunately, a remedy will soon be forthcoming: Terry at Bluster Bay Woodworks wrote me recently to tell me that he just got a stock of beautiful curly maple, which will make a nice fifth shuttle to add to the herd. First, the medium peach sections near the bottom (below the “H”) distract from the main figure. Second, the golden brown just doesn’t fit with the rest of the colors – there’s too much yellow in it, so it sticks out like a sore thumb. And the main focus point (“HI”) is centered top to bottom, deadening the piece. This still isn’t great art (though if you want to pay me a million dollars for it, I won’t object 🙂 ), but it’s a stronger design than the previous one. I eliminated the golden brown and changed the arrangement of the orange stripes to make it look a little less chaotic; I also put “HI” about 2/3 of the way to the top, making it more visually interesting. This results in a more focused piece. The bottom sections are for my convenience – all the shades of 8-end satin, from 1/7 to 7/1, ready to be cut and pasted. 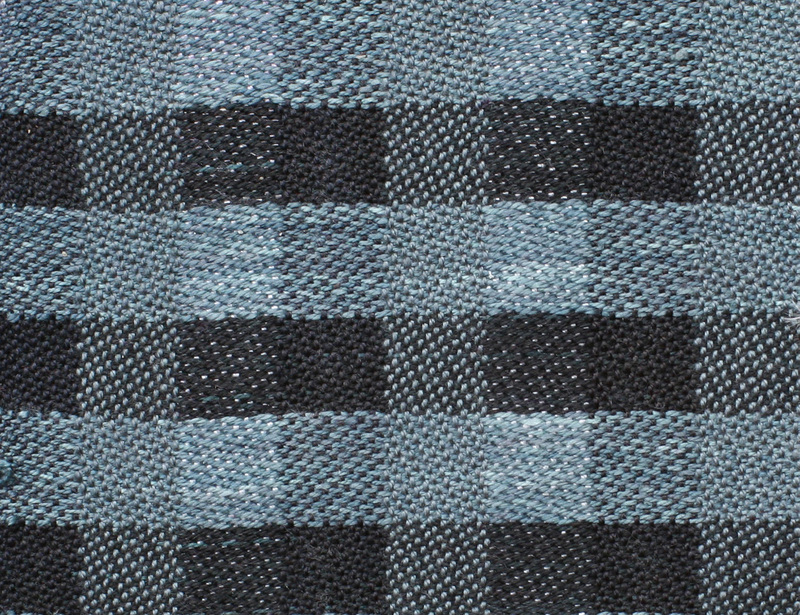 The sections at the top determine the interaction of warp and weft in each stripe of color. Shafts 1-8 represent one color, shafts 9-16 a second color, and 17-24 the third color. The remaining 16 shafts are devoted to the white dividers between sections and the selvages. 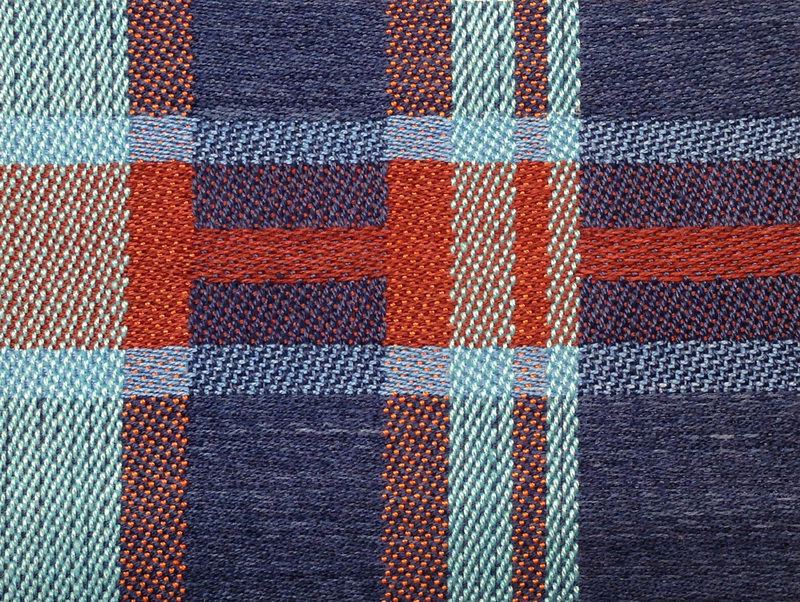 Each set of eight picks represents three blends of warp and weft (plus the selvages and white dividing lines, which are woven in 4/4 satin throughout). Looking at the liftplan shows the blending of each set of colors. For example, in the eight rows at the top, shafts 1-8 and 9-16 are 7/1 satin, meaning the weft will heavily dominate those two colors. 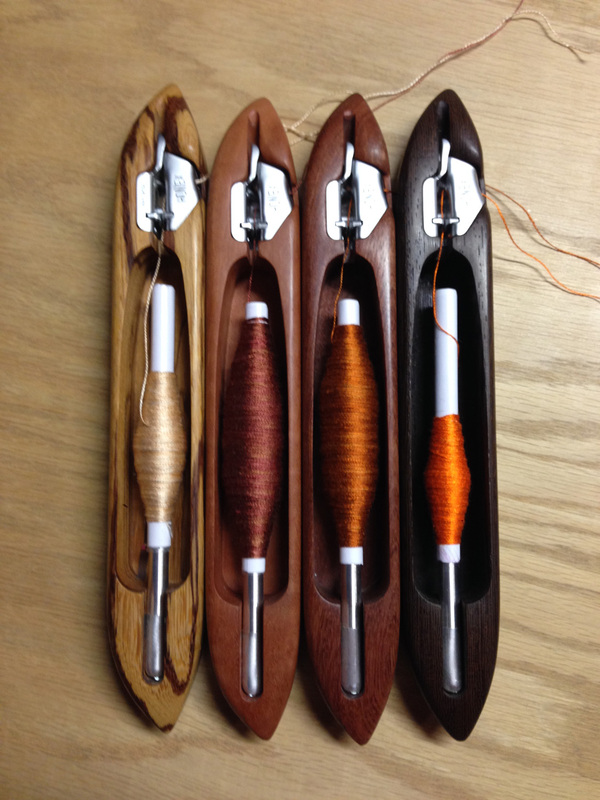 Shafts 17-24 are 4/4 satin, so the third warp color will weave up as a 50-50 mix of warp and weft. And so on. 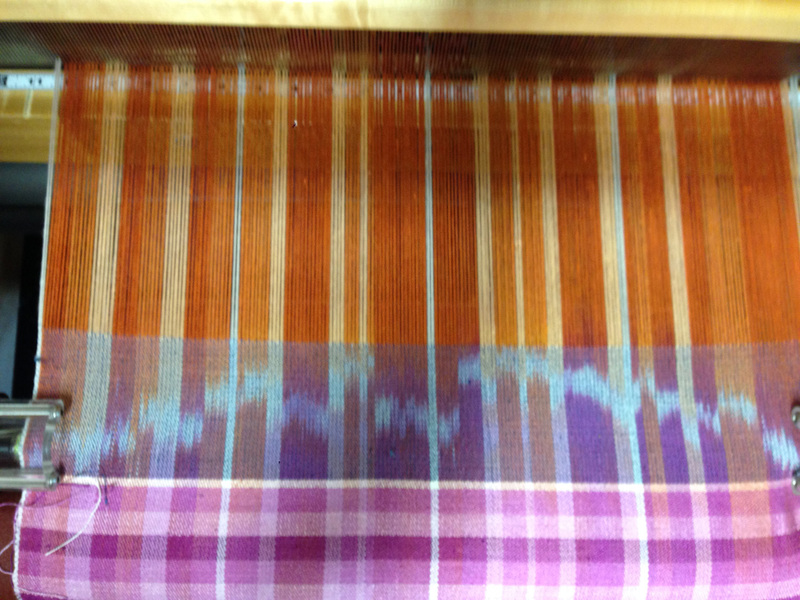 So before starting each stripe of weft color, I consider how I want to blend the weft colors with the warp colors. I can make the warp essentially invisible by choosing a 1-7 satin, or I can make it dominate completely by using 7-1 satin. Or I can blend the two by choosing something in between. Once I’ve decided what degree of blending I want, I go down to the bottom of the drawdown, and cut and paste the appropriate patterns into eight rows of the liftplan. I then repeat that set of eight picks for the length of the stripe. I’ve got six different blending patterns saved in the top part of the liftplan, so I don’t have to start from scratch every time. This gives me flexibility without compromising too much on speed. 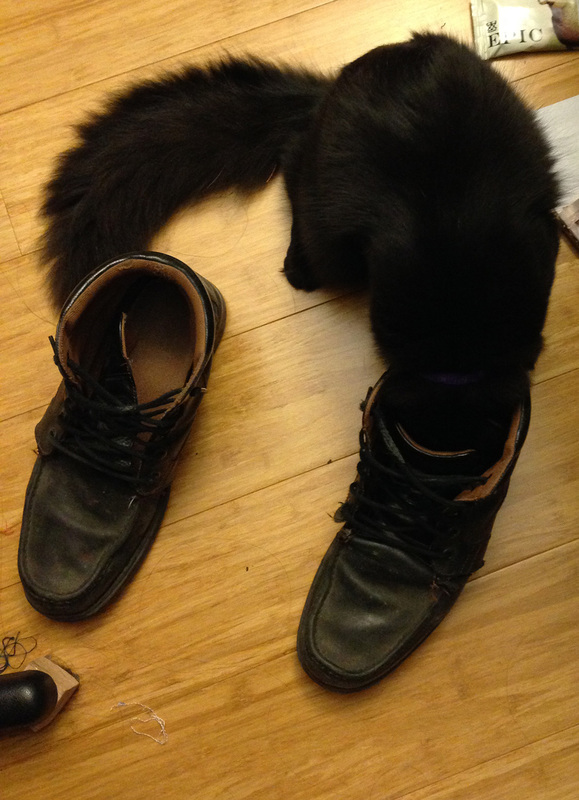 What’s next for this shoe-sniffing addict? 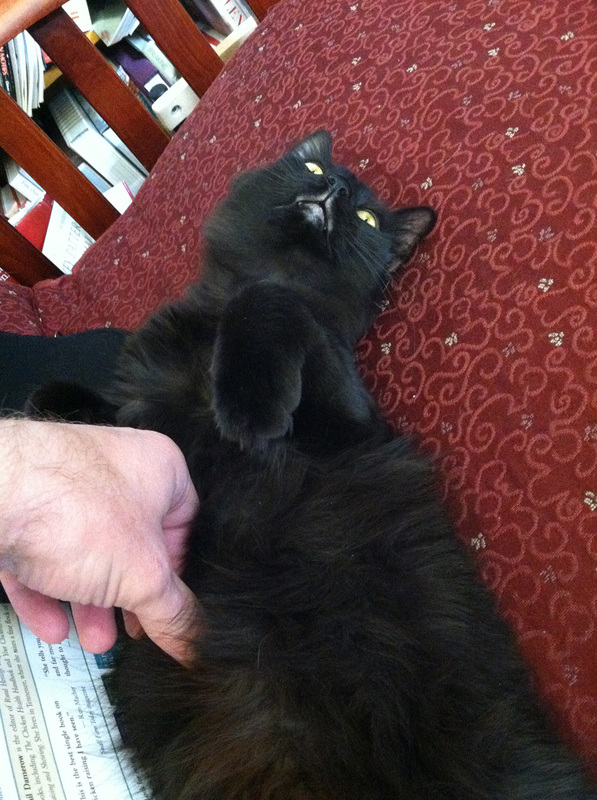 Catnip?